Much has been said concerning Paul Morphy's so-called "madness." What is known amounts to much less. There's seems to be no doubt that Morphy started displaying some uncharacteristic behaviors starting sometime prior to his 40th birthday. It also seems likely that these behaviors were much less startling that what the news media of the time intimated. Whether the term used is "madness," "insanity," "dementia," or any other similar meaning word, it usually implies a severely reduced capacity to function in a society. Neither eccentricity nor personality fluctuations really carry such extreme connotations as what "madness" would demand. Those around Morphy at that time chose to simply ignore the media's sensationalism. Apparently with the conviction that Morphy's private life should not be a source of public entertainment, they refused to acknowledge what was being printed or to respond to inquiries. At some point it must have become evident that those from his chess days who had known and cared for Morphy as a person and not just as a phenomenon were also being mislead and misinformed by the media. As a result, Charles Maurian issued occasional reports that tried to put things in a more realistic light. "It was in 1875 that Maurian first began to notice some strange talk by Morphy as mentioned in his letter below. Soon after, Morphy's imbalance reached a climax when he suspected a barber of being in collusion with one of his friends, Mr. Binder, whom he attacked, actually trying to provoke a duel (Maurian said he was a good swordsman), believing the friend had wronged him. This raised the question of mental competence. As a consequence of the attack, thinking it might be the prelude to further violence against himself or others, his family considered putting him in an institution for care and treatment, the "Louisiana Retreat," run by an order of the Catholic Church. So one day all the family took a ride, and he was brought in. Upon realizing the situation, Morphy so expounded the law applying to his case that the nuns refused to accept him, and his mother and the others realized he needed no such constraint." The Louisiana Retreat was located on on Henry Clay Avenue - between Coliseum St. and Chestnut St. 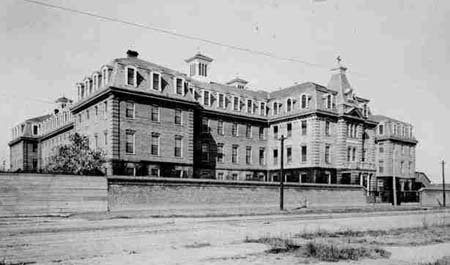 The Sisters of Charity of St. Vincent De Paul started caring for the mentally ill in 1841 at Charity Hospital ( a 300 bed facility) and in 1863 the Sister's established a sanitarium specifically for that purpose at the hospital. In 1876 they acquired their own facility (shown on left). This is where Morphy was taken. The Louisiana Retreat for the Feeble Minded, as it would be called in 1896, eventually became DePaul Hospital located at 1040 Calhoun Street, New Orleans. The original building still exists as part of the hospital. One must consider that the reason why Lawson says, "This raised the question of mental competence" couldn't be because of the fact that Morphy challenged Binder to a duel but rather must be because Morphy's "attack" was considered unprovoked. Duelling (as it was referred to) wasn't an uncommon means of resolving conflicts in the Creole culture. Though by 1875, this method was fading, it was far from gone. Most duels weren't fought to the death (although the fatal potential always hung in the air) but usually ended when one party inflicted some damage upon the other. For a traditionalist such as Morphy, challenging one's transgressor to a duel was the proper response for a gentleman. It is unfortunately true that Mr. Morphy's mind has been deranged of late but not to the extent that the New York Sun would have us believe; for I fervently hope that the kind attention of his family will in time result in a complete cure. I noticed that the kind attention of his family will in time result in a complete cure. I noticed some time ago some extraordinary statements he made of petty persecutions directed against him by unknown persons, that there was something wrong about him, but after a while he openly accused some well known persons of being the authors of the persecutions, and insisted upon their giving him proper satisfaction by arms. Thus it is that the matter was noised about. Outside of the persecution question, he remains what his friends and acquaintances have always known him to be, the same highly educated and pleasing conversationalist. An attempt was made to induce him to remain in the "Louisiana Retreat, " an institution for the treatment of insane persons, but he objected and expounded to all concerned the law that governed his case and drew certain conclusions with such irrefutable logic that his mother thought, and in my opinion very properly, that his case did not demand, such extreme measures as depriving him of his liberty, and took him home. He has been very quiet of late and seems to have been impressed with the remark of some good friends about his "persecution mania." I met him some days ago and the objectionable subject not having been broached, he was as rational and pleasant in his conversation as anybody else. Since somewhere about 1864 or 65 Mr. Morphy has had a certain aversion to chess. (Indeed he never was, strange at it may seem, an enthusiast.) This was caused, no doubt, by his being constantly bored to death by all sorts of persons who thought it a nice thing to play a game with the champion of the world or to ask him in how many moves he could force mate in a fame, or what was the best way to open a game, or to be kind enough to solve this or that problem &c, to say nothing of the mountains of stupid letters he was called upon to read. At that time he told me very frankly that he was going to abandon completely everything in the shape of public chess. But he consented to play with me as often as I should like. After this he went to Europe and on his return, observing that he only played with me to please me, I ceased to impose this species of penance on him. Our last games were in 1869 in the month of December. It is an error to suppose that Mr. Morphy is an idler. He is engaged in no particular business, it is true, but he is fond of literature, an enlightened admirer of the fine arts, a great lover of books and he loves study. He is rather of sedentary habits (a great deal too much so), his tastes and habits are eminently refined, and his deportment is always gentlemanly; I may say aristocratic. He was a regular frequenter of the opera, that is, when our city was rich enough to support one, and he was able to appreciate the beauties of music and to understand and feel and profit by the elevating influences of the works of Mozart, Rossini and Meyerbeer and other great masters. I assure you, my dear sir, it will be a pity indeed if disease impairs permanently such a powerful brain, such a splendid mental organization, one so well stocked, too, with learning and varied information. In a letter I received from you some days ago, you beg me to inform you if it is true that certain rumours about Paul Morphy are true that he may not be right mentally. I am sorry to have to reply to you that these rumours are only too well founded. I must hasten to add, however, that some of the American papers have greatly exaggerated the facts, especially when they represent his case as absolutely beyond help. Mr. Morphy thinks himself the object of the animosity of certain persons who, he claims, are trying to injure him and render his life intolerable to him by a regular system of calumnies and petty persecutions. There is no way of persuading him on this point, but on any other subject he is quite reasonable. The fixed idea which possesses him has led him on certain occasions to conduct himself in a somewhat extravagant manner, Thus, about two months ago he strove hard to provoke to a duel a gentleman whom he imagined to be one of his persecutors. Since then he seems more tranquil. and it has not been considered necessary to put him into an asylum, as some papers have said. All his friends hope that in time, with care and above all with a change in his mode of life, he will completely recover. As for the causes which have produced in Mr. Morphy this derangement of his faculties, it is difficult to assign them, and I do not know what the doctors think. I have reason to believe, however, that in their opinion chess has nothing to do with it. ; for one of them, I am told, has recommended chess as a means of distraction and a change of thoughts. You know, that for ten or twelve years Mr. Morphy had completely abandoned chess, and that he never indulged in the game to excess. For my part, without wishing to hazard an opinion on a question which is beyond me, I cannot help thinking that the sedentary life, devoid of distractions and amusements, which Mr. Morphy has led for some years, must have had a bad influence on his whole system. The Sun of the 24th inst. contains a repetition of the oft-told lie about the insanity of Paul Morphy - that he had not played chess for a long time, and so forth, ad nauseum. Will you have the kindness to publish the following, which contains all of the facts concerning Paul Morphy with which the public have anything to do? He is now practicing law in this city, and has never been insane, or spoken of in that relation by his family or friends. As to chess, he is unquestionably to-day the best player in the world, although he does not play often enough to keep himself in thorough practice. He gives odds of a knight to our strongest players, and is seldom beaten, perhaps never when he cares to win. His disappearance from the public view as a chess player has just this explanation - no more, no less. The publicity and lionizing which attached to him for a time, both in this country and Europe, were always distasteful to his family, and especially so to his mother. On his return from his European triumphs, he entered into an engagement with his mother never again to play for a money or other stake; never to play a public game or a game in a public place, and never again to encourage or countenance any publication of any sort whatever in connection with his name. This last clause in the agreement has heretofore been so strictly construed as to prevent any denial by him or his family of the numerous silly publications that have been made concerning him. It is now time, however, that the thing be stopped. Will you have the kindness to inform the public at large, and newspaper paragraphers in particular, the Paul Morphy is engaged in a strict attendance upon his own affairs, and that his family and friends do not at present adjudge him of any assistance therein. New Orleans April 16, 1879. During my visit to the South, after seeing the sights of the crescent City, I was seized by the desire to inform myself in regard to its chess affairs - to see or meet Morphy, or learn the particulars about him. Having satisfied my curiosity in these respects, I have thought that the relation of what I have learned may be interesting to others and sufficiently respond to your suggestions in reference to a letter about chess. archway at the end into a flowering court beyond. The colored damsel returned saying that she was mistaken; that Mr. Morphy had gone out with his mother, but that I could see him at another time. I have since came to regard it as very a fortunate circumstance that I failed to see him while misunderstanding the true nature of affairs. I learned from undeniable authority that he utterly repudiates chess; that when addressed on the subject he either flies into a passion or denies that he knows or ever did know anything of the game. Occasionally, I hear, he admits that he used to play chess some, but not enough to justify persons in attaching notoriety to him. He professes to be a lawyer of prominence, and, although he has no office, no clients, and spends hours promenading Canal St. daily, he imagines himself so pressed with business that he can not release himself for the briefest time. The great case that absorbs nearly all his attention in an imaginary one against parties who had charge of an estate left y his father. He demands a detailed, explicit account of everything connected with their administration for a number of years, and they pay no attention to his demands and repeated suits, because it is supposed, of the trouble, and because everybody else interested is satisfied and knows there is nothing coming to him, he already having expended more than his expectancy. At certain hours every day Paul Morphy is as sure to be walking on Canal Street as Canal Street is sure to be there to walk on. People shun him for the reason that the least encouragement will result in being compelled to listen for hours to the same old story that everyone knows by heart -- that relating to his father's estate. He talks of nothing else, and apparently thinks of nothing else. His personal appearance is not all that striking and were it not for his singularity manner, he would rarely be noticed in a thorough-fare. He is of less than medium height and thin in body; his face is yellow and careworn, showing every day of his forty-two years of age; and destitute of a beard except an effort at a moustache on a thick upper lip; his eyes are dark gray, large and intelligent. He is always, while on the street, either moving his lips in soliloquy, removing and replacing his eye-glasses, and smiling or bowing in response to imaginary salutations. His scrupulously neat dress renders him a much more agreeable object of curiosity than he would be if he were indigent in his attire. Physicians regard him as a very peculiar case, amenable to treatment, possibly, if placed under their care; but no opportunity is afforded, as he regards himself as sane as any man, is harmless to society, and is well cared for by willing relatives. Medical experts who have made mental phenomena a study, also say his chess strength is probably not at all impaired, possibly increased from a long rest, and that if he were so inclined he could astonish the world with his wonderful powers more than ever. Judging, however, from his long retirement from the chess arena, and from his persistent devotion to his insane idea, it is only a reasonable inference that Paul Morphy is forever lost to the chess world, and that he will continue to keep buried those talents that would benefit the world and gain honor for himself, together with the wealth he wants and needs, and which he is striving for so energetically in a way that is visionary and hopeless. On the street in New Orleans, last month, I frequently saw Mr. Morphy but I was longer in his presence, and had a better opportunity of studying him at the old Spanish Cathedral on Easter Sunday than elsewhere. He paid devout attention to the services, and appeared thoroughly familiar with all the ceremonies, always assuming the kneeling posture, and moving his head and lips responsively at the right time, without apparently taking a cue from any of the worshipping throng. At one time an untidy person brushed his back, and he seemed distressed for some moments with the idea that his coat had been soiled, endeavoring to brush it with his handkerchief. I caught an inquiring look from his eye, and my glance must have satisfied him that his coat presented a proper appearance, as he immediately composed himself and resumed his attentive air, even spreading his handkerchief on the aisle and kneeling on it. I have spoken of his imagined salutations, and his pleasant bow and smile, and graceful wave of the hand, in response. This must have occurred twenty or thirty times as he stood behind a massive column for a few minutes, in a position in which it was impossible for any one to see him from the direction in which he looked. In the speculations regarding his mental derangement it has been natural to attribute it, in a great measure, to an over-exertion of brain power in his wonderful feats at chess, but nothing has ever been found to establish positively such a conclusion. His astonishing achievements appeared to cost him no effort. Analyses that would require weeks of laborious study on the part of the greatest masters, he would make as rapidly as his eyes could look over the squares. His eight or ten blindfold games, played simultaneously against strong players, appeared to require no more attention than the perusal of a book or paper. With rare exceptions, he appeared to know intuitively the strongest moves that could be made. His uncle, Ernest Morphy, during his visit to Cincinnati many years ago, told me how Paul, when a child, would suddenly drop his knife and fork at the table and set up on the checkered table-cloth a problem that had suddenly sprung into his head, using the cruets, salt0cellars and napkin rings for pieces. I asked his if his nephew was remarkable for anything else than his peculiar aptitude for chess, and I recollect that he stated, among other things, that after his return from a strange opera he could hum or whistle it from beginning to end. At school, and afterward at college, Paul Morphy was always criticized for his continuous study and aversion to youthful sports, he never taking part in outdoor games or athletic exercises. So it seems that chess is not to blame for his present, singular condition, except as it represents a portion of the mental operations in which his brain was constantly employed. It is unquestionably an instance of a brain excessively developed at the expense of the physical man, having the mind expanded to the utmost bounds of sanity, and ready to wander outside its limits on the occurrence of some peculiarly exciting circumstance, and this happened, probably, in the sudden realization that what he had considered a competency was expended, and that he had become, for the present at least, dependent. After this he was in no condition to reason - to see that he had lived extravagantly while abroad and after his return, and that his expenditures were in excess of his share of his father's estate. He imagined that he had been defrauded, intentionally or through mismanagement; hence the litigious course he has pursued. Possibly his aversion to chess came through associating it with his misfortunes, his heaviest expenditures having occurred while away on his victorious tour through Europe. Some have thought a complete restoration of his normal mental condition might follow a rendering of the particularized account he demands from trustees or administrators, for he is wonderfully acute with figures, and might be convinced if incontrovertible calculations were placed before him. Why it is not done is not known; whether on account of an impossibility, the amount of labor and trouble, or because of an indifference that is thought justified through the entire satisfaction of other interested parties. I understand that he has a right to demand such an account, and that he could enforce it, probably, if he were not regarded as insane, or if others would join his cause for the sake of humoring him. It is said, to the reproach of certain lawyers, that they would advise and encourage him in his hopeless case as long as he had money to fee them, but that now they will not give him a hearing. Suggestions in reference to medical treatment amount to nothing, because he acknowledges no ailment. Efforts have bee made to induce him to travel, that his physical health might be benefited, and that his mind might be diverted from its absorbing subject; but he regards this as playing into the hands of his enemies, says his absence from New Orleans is just what they are scheming for, and avows his intention of remaining to defeat them on their own ground. It is distressing to admit that Paul Morphy is hopelessly lost to the intellectual world. Must that superhuman mind be forever devoted to the pursuance of such a petty, insignificant object, when it is capable of exerting such wondrous power? The gratitude of all mankind awaits him who can devise some means for giving flesh and strength to that attenuated body, and restoring the equilibrium of that disturbed brain, thus replacing this shining star in the brilliant galaxy from which it has fallen. "One of these hobbies was that his brother-in-law, John D. Sybrandt, and also one of his most intimate friends, Mr. Binder, wanted to destroy all his clothes and wanted to kill him. He made an attempt to assault Mr. Binder in that gentleman's office, using his small walking stick, which Mr. Binder, who was a very powerful man had no trouble in taking away from him." "II plantera la banniere de Castille sur les murs de Madrid au cri de Ville gagnee, et le petit Roi s'en ira tout penaud." (He will plant the banner of Castille upon the walls of Madrid to the cry of victorious city, and the little King will go away looking very sheepish)." "For quite a while he was under the impression that someone was trying to poison him, and in consequence refused to eat anything unless the cooking had previously been supervised by either his mother or his sister." In a Broadway print shop a picture of Paul Morphy, the once famous monarch of chess players, is on view. It is a pastel drawing, with a good deal of life and vigor about it. The artist is Paul Schoeff, a barber, who recently came to this city from New Orleans to study art on his savings. To our reporter, Schoeff told a curious story of the original of his picture. "Mr. Morphy is crazy," he said, "and lives with his mother and a servant. He is harmless, and no one ever has any trouble with him. His manias are very peculiar ones, and it is to one of them I owe my acquaintance with him. He is possessed of a belief that the barbers are in a vast conspiracy, suborned by his enemies, to cut his throat. There are only one or two shops in New Orleans he will enter, and when a strange barber, or even an old one, operates on him, he watches him closely, on the alert always for a suspicious movement. Often he springs from his chair and rushed into the street, half-shaved, lathered and with a towel about his neck, screaming murder. Everybody knows and likes him, however, and though he is a nuisance, they pity him too much too refuse to shave him. You might wonder that he gets shaved at all, or at least does not shave himself, but here another of his manias comes in. He is a confirmed fop, and sometimes changes his clothes as often as a dozen times each day, each time going out for a walk, saluting all sorts of imaginary acquaintances as he trips along, and returning to get himself up all over again. Of course he must be as immaculate in his hair-dressing as in his person, and nobody but a barber can do him justice. I worked for a man named Schmidt, to whose shop Mr. Morphy used to some to get shaved. I was the boy of the shop, and was just learning to use the razor. One day Mr. Morphy came in, looked around and beckoned to me to shave him. The boss and the barbers winked at each other, as much as to say: "Well, he is crazy, sure enough," but no one interfered, for you must always let Mr. Morphy have his way. Well, I lathered and shaved him, fortunately without a cut, though I was so excited about shaving a lunatic that it is a wonder I did not really cut his throat. From that time forth, he never had anyone else tend to him. I was practicing drawing then, and the boss used to let me work in the back of the shop when there was nothing else to do. Mr. Morphy noticed my drawings, and one day, without a word, he sat down on a chair, pointed to himself and to my drawing board and nodded. I knew what he wanted, and went to work and made a picture of him, He sat for me every afternoon for a week. When the picture was done I presented it to him. Next day, when he came in, he gave me a little bundle. It contained a handsome silk handkerchief, a scarf and a fine scarf pin. Poor Morphy had given me his pet finery, for they were things he was very fond of wearing himself. The picture I brought with me is one I drew from the first sketch of the old one, and it is a good bit better of the two. I wear his presents with my Sunday suit. "Another base rumor that was amplified in print represented him as a silly fop, intoxicated with vanity, parading the fashionable streets of New Orleans, ogling the ladies and impertinently saluting them with bows and grimaces. This report is false and cruel." On a recent occasion Mr. Morphy hastily entered the office of a well-known resident of New Orleans, and made known his need of two hundred dollars to save himself from impending disaster, and requested a load of that amount. His friend resolved on an experiment which would test the relative strength of the hold upon Morphy's mind of this delusion, and the other - his aversion to chess, and assuming a serious tone, he said: "You want this money very much, it seems." "yes," said Morphy, "I must have it - it is absolutely necessary." "Well," replied the other, "I'll tell you what I will do: if you play a game of chess with me, I will make it two hundred and fifty dollars." Morphy's countenance betrayed the internal struggle between the conflicting emotions aroused by this offer. He paused, in thought, for some moments, and then in a tone expressive of his sense of the hardship inflicted upon him by the condition, and also, of a quiet exultation over the anticipated success of a plan he had formed, he accepted the terms; chess-board and men were produced in an inner office, and Morphy played his latest game of chess. With a disdainful curl of the lip, and a manifest repugnance, Morphy moved in such a way that his friend mated him in a very few moves, whereupon Morphy exclaimed, "There! I have done what you require: but the next time I play chess with you, I will give you the Queen!" and already oblivious of his pecuniary necessities, he was going away, when his friend reminded him that he was forgetting his reward. "I will come for it tomorrow!" was his reply, as he left the apartment." Lawson adds that the perceived need for the $200 didn't last long. Mr. Steinitz, "said a TRIBUNE reporter to the chess champion recently, "it has been stated that you sought an interview with Morphy under the pretence of being a lawyer interested in his legal troubles. Is that so?" Certainly not," was the answer; "that would have defeated the very object I had in seeing him. Morphy is a pretty shrewd man, and would soon have detected the imposition. The truth is I have been interesting myself lately in international law, with the intention in the near future of writing a short treatise on it. When in New-Orleans a few weeks ago, knowing that Morphy was a lawyer, I wrote to him. On getting no answer, the first time I met him in the street, I stopped him and presented him with my card. He took it and read it, giving me a wild, questioning look for the moment. Immediately recovering himself he shook hands with me, saying that my name was well known to him and then he entered into conversation with me. Twice after that I met him, and on each occasion he was exceedingly pleasant and agreeable. As a crowd collected round us on each occasion, he excused himself on the score of pressing legal engagements. I am very angry with that crowd still for interrupting us; Morphy is a most interesting man to talk to. He is shrewd and practical and apparently in excellent health. I am convinced that his derangement is purely local and quite curable if he would place himself under medical treatment. If his derangement were general, his bodily health would suffer and he would knew [sic] that he was ill. At present he does not know it. His misfortune was to be born too rich. When he lost his money he could not stand it, and he now has the idea that there is conspiracy against him to keep him penniless. I took the opportunity of remonstrating with him. And told him he had a number of legal friends; if he would allow them they would thoroughly investigate his business matters, and if he had a chance to recover his property, would tell him so. 'Though, 'I added, 'even Morphy may be mistaken, and you may not have taken a correct legal view.' 'That is it,' he answered; 'people think I am nothing but a chess-player, and that I know nothing about law.'" "Will Morphy ever play chess again, Mr. Steinitz?" "Probably, if his friends go to work in the right way. At present he will not look at a board and never visits his club, under the apprehension that they will make him play. I myself know what his feeling is. In 1867 I suffered from a sunstroke. For weeks I could not concentrate my energies on anything, least of all on a concrete science like chess. At last I determined to do it, believing the effort would cure the affliction. It was torture at first, but it succeeded. The concentration required took the mind off itself. Now Morphy, when he sits down to a board, finds he cannot concentrate himself. Then for the first time he feels that there is something wrong with him; rather than confess it, he gets up abruptly, alleges an engagement, and rushes away. What I said to the men at New-Orleans was: 'Do not ask Morphy to play; let him sit and watch you play, perhaps one of his own old games. Presently he too will take to the board again, and the effort required will take his mind off his trouble.'" "Why does the loss of his money affect him so much?" "That is another curious thing. Morphy wants to get married. He is perpetually having love affairs. All the people in New-Orleans know it and humor him a little. Mind you, he is the most chivalrous soul alive. He is a thorough gentleman. But if he sees a strange face in the street that pleases him, you will see him lift his hat and give a bow. Sometimes the lady will stop kindly and speak to him or smile and pass on. Then he will follow her at a distance - sometimes for hours - and when she enters her house, take out his note-book and enter the address. He regrets his loss because he wishes to be married, and the cure is, I think, the same as in my own case - to play chess again determinedly." defray all his expenses I have followed no calling and have given no cause for a biography. I have received a diploma as a lawyer. I have the honor, Messrs. Editors, of presenting you with my most distinguished sentiments.